TRANSPARENCY IN THE HEAVENLY REALM, is more than a book. It is a transfer of power, revelation and knowledge to breakthrough the barriers of life. Many of you have been longing to experience the presence of or want an encounter with God. Now is the perfect time to welcome him into your life. 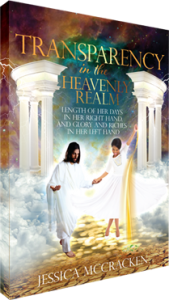 Through accessing the Heavenly Realm, you can be transparent and concealed in Jesus.